A Warranty Registration Form must be submitted online to make warranty effective. A customer has 15 days to register online once their product is received or the warranty will backdate to the shipment date from the factory. If more than 12 months have passed when we receive the warranty form submission, then we will notify the customer that the warranty period has expired. 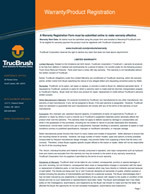 TrucBrush Corporation reserves the right to decline any claim that does not meet above requirements. Pre-Approval Required Prior To ANY Work Being Performed.